Question: How many Hollywood Biographies tell the real story? I recently watched Universal Pictures 1957 “The Man of a Thousand Faces” starring James Cagney as Lon Chaney. The films ends with a very tear jerking scene as the dying Lon Chaney, Sr. asks for his make-up case. Roger Smith playing his son gets it and hands it to Cagney. Who then takes a white grease paint stick and ads “Jr.” after his own name! 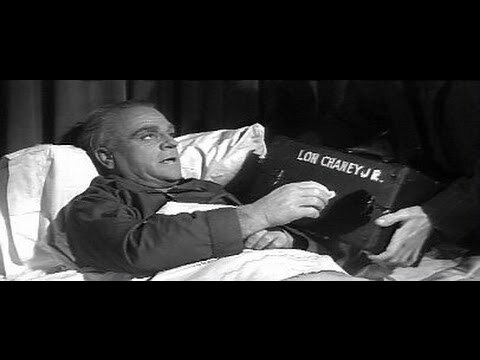 The case now reads “Lon Chaney, Jr,” and Cagney hands it back to Smith and peacefully passes away. Movies are great theater, but truth may be a bit different. My father would be horrified if he knew I was making it in the pictures and that I'm not billed as Creighton Chaney. The truth not shown in "The True Story of the Life and Loves of Lon Chaney", As billed by Universal Pictures was that Lon Chaney, Sr. had died a few years before Lon Chaney, Jr. was "born" at Commodore Pictures not even Universal Studios as most people believe. Leonidas Frank Chaney married Francis Cleveland Creighton on May 31, 1905. Another misdirection from “Man of a Thousand Faces” is the apparent ages of the two at this time. In reality the star power of James Cagney and Dorothy Malone may have brought in the audience to see "The Man of a Thousand Faces", but both were too old. Lon at 22 was being played by the 58 year old Cagney and “Cleva” was only 16. While Dorothy Malone was exactly twice that age. Less than one year after their marriage on February 10, 1906 in what was still the Oklahoma Territory. Francis gave birth to a son they named Creighton Tull Chaney. He was born prematurely, only 2 1/2 pounds at birth. The illnesses he suffered at the end of his life may have been partially the result of this. In fact, he was born, in his own words, "black and dead". His father took him outside to an ice covered lake, broke the ice and put him into the ice cold water to jump-start his breathing. However, according to his son Lon Ralph Chaney as well as Cleva's daughter by her second marriage, Stella George, the story is complete fiction. Four years after the birth of Creighton the family of three settled in California. By the age of 6 Creighton's was appearing on stage as a prop in some of his father's acts. 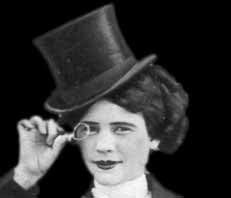 Three additional years later unspecified marital problems boiled over and on April 30, 1913 Cleva dramatically walked onto the the stage of the Majestic in downtown Los Angeles during a performance and attempted suicide by swallowing mercuric chloride a compound of mercury and chlorine.The result of Francis Chaney’s action was not suicide, but doing enough damage to her vocal chords that the singer would never be able to perform in that capacity again. For those of my readers who might be interested the Majestic theater is still open in downtown Los Angeles at this time showing Spanish language films. The timing of the divorce of Lon and Cleva, again not specifically mentioned in the movie, was either in 1913, or quiet possibly the beginning of 1914. I could not find anything giving the actual date in my research and even one article claims it was in 1915. Once more contrary to the way incidents in Lon Chaney seniors life were portrayed in the 1957 Universal motion picture. After their divorce Cleva had no issues with Lon becoming sole guardian of Creighton and even supported it, because he was self-sufficient where she was having trouble finding work. Creighton was placed in a boarding school shortly after the suicide attempt, which the movie got right, but only because the courts felt even with his income Lon as a single parent could not raise a boy of seven by himself. Additionally many biographies state that Creighton was led to believe his mother was dead and it wouldn't be until after his father's death that he found out the truth. Contrary as presented in the motion picture biography of his father. The "Official" Lon Chaney family website does not mention ether the when, or the circumstances around Creighton finding out the truth of his mother. We know that the “Kolb and Dill Show” went on a thirty week tour to Australia in May of 1914 which would take them into December. The Australian Tour included stops in Hawaii and other Pacific Locations. It appears that Lon left the show at this time. This is important, because of Hazel Bennett Hastings. Hazel Bennett was originally married to Charles S. Hastings. 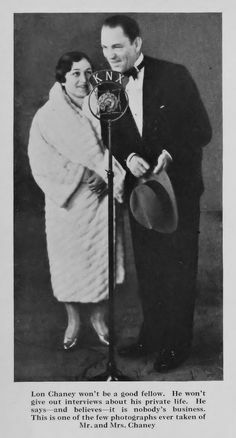 After her divorce Hazel eventually found acting work with the “Kolb and Dill Show”. What she actually did with the show I could not locate. I bring this up as “The Man of a Thousand Faces” implies she was partly the reason for Francis Cleveland Creighton Chaney’s attempted suicide. I couldn't find any direct evidence for that accusation. It appears Hazel may have met her future husband after the divorce. When she would occasionally watch young Creighton for Lon while he worked. Additionally, I couldn’t establish the date, but sometime around Creighton’s 10th birthday in 1916. Hazel Bennett Hastings married Lon Chaney and they established the household needed for the boy with the courts. Information seems to support that Hazel and Lon were reunited sometime after the Australian Tour and perhaps by an accidental meeting at Universal Studios. I do know that Clarence Kolb became a full time actor in 1917 with Universal Studios and it is probable that Hazel and other cast members were getting bit parts with Kolb as early as 1915, When Kolb started at the studios also..
Lon Chaney and Hazel Bennett Chaney from March 1929. Returning to “The Man of a Thousand Faces” there is a scene where Lon Chaney confronts a man Cleva has been dating. The character is just named Bill and it turns out that he does not have real legs, but metal frames as replacements. The scene implies that this incident affected Lon and led to one of Chaney’s “Thousand Faces”. Once more I cannot confirm, or deny that the incident didn’t occur in real life, but in 1919 Francis Chaney remarried a William Bush, whom I could not locate any specifics about. It appears she was with him until his death on November 16, 1946. The two had one child Stella Bush born April 26 1930. Cleva passed away on November 21, 1967 in Sierra Madre, California. Creighton attended Los Felix Elementary School in Hollywood. During his teens Creighton attended Hollywood High School on Highland Avenue. Two of his fellow classmates at the time were Joel McCrea and Fay Wray. Actually most of Hollywood sent their children there. Six foot tall Chaney tried out for the football team, but was turned down as he only weighed 125 pounds. From time to time Creighton still accompanied his father to the studio. He would take a trolley from the corner of Hollywood and Vine that went out to the studio in the San Fernando Valley. The park bench the young Chaney waited on was eventually removed many years later and a memorial to his father placed at that spot, However, there was more to the story of that Trolley Car Bench than just that fact a silent film star's son sat on it. In 1922 the future Lon Chaney, Jr. appeared in the film “The Trap” starring his father. Actually it was the 16 year old Creighton’s hand that actually made an appearance. After Creighton graduated Hollywood High School and again against what we see in the movie “The Man of a Thousand Faces” with that touching ending. Lon Chaney blocked all attempts by his son to enter the motion picture profession. 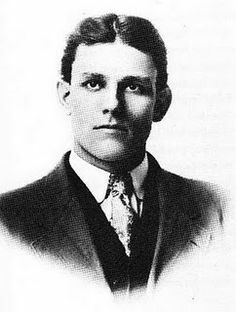 Creighton who had been doing add jobs enrolled in a Business School and afterwards went to work for a Plumbing Company owned by Ralph Hinckley. In 1928 Creighton married his bosses’ daughter Dorothy. Some biographies say the year was 1926. They would have two sons Lon Ralph Chaney and Ronald Creighton Chaney. A normal domestic life seemed to be were Creighton was headed until August 26, 1930 when the world lost “The Man of a Thousand Faces” from throat cancer and Lon Chaney was laid to rest at Forest Lawn Memorial Cemetery in Glendale, California next to his father. Should you go by yourself to locate his grave site you will not find it and will need assistance as the crypt has remained unmarked all these years. So it was that Creighton Tull Chaney got his first, but non-screen credited movie role in Mascott’s movie serial “The Galloping Ghost”. The serial starred Harold “Red” Grange the real life college and professional football halfback known by that name playing a fictional version of himself in 1931. In 1932 Creighton signed a contract with RKO Pictures and appeared in the 1932 adaptation of the Broadway Play “Girl Crazy” in another non-screen credited walk on. Three pictures later and he was the star of an RKO 12 Chapter serial “The Last Frontier” aka: “The Black Ghost”. An interesting film Creighton appeared in at this time was the 1933 Mascot serial “The Three Musketeers”. The serial would be released in a heavily cut down version in 1946 as the movie “Desert Command”. The serial had nothing to do with the Alexander Dumas’ novel and takes place in the French Foreign Legion. The only reason the edited version was released is that the original serial starred John Wayne and as Lt. Armand Corday "Creighton" Chaney, but for that 1946 re-release Creighton was now billed as Lon Chaney, Jr.
Below a still from the serial with Creighton lying on the floor. On Halloween, October 31, 1933 Hazel Bennett Hastings Chaney passed away. When exactly Creighton Tull Chaney became Lon Chaney, Jr. is confusing. Some articles say 1935 and others 1936. It appears to have been actually 1934 though. On most filmographies for Lon Chaney, Jr. the movie “A Scream in the Night” is listed as 1935. The film was actually released by Commodore Pictures June 29, 1934. The film’s posters state it stars “Lon Chaney, Jr.” and he plays Detective Jack Wilson a colonial police detective and the lead character of the film. Adding to the confusion is that every reference I found for any film that had Creighton Chaney as an actor before this film has been changed to read Lon Chaney, or Lon Chaney, Jr. I feel safe with my year as I used the original Commodore Pictures poster and not the one from the 1946 re-release by Astor Pictures. Some articles even list the first movie Creighton appeared as Lon Chaney, Jr. to be the 1936 Republic Serial “The Undersea Kingdom” starring Ray “Crash” Corrigan. Who most of my readers know not as the Cowboy actor he was, but the title character in 1958’s “It, the Terror from Beyond Space”. Lon played Captain Hakur, the Black Robe Commander in what is considered by many movie historians to be his most colorful henchman! Everyone connected with the serial gave over the top performances. Sometime during 1937 Creighton divorced Dorothy and left everything he had at the time to her and the boys. He had been meeting a young starlet named Patricia (Patsy) Beck since 1936. The two would marry shortly after the divorce became final and she would be with Lon until his death. Between “A Scream in the Night” no matter its true year of release and his 1939 Classic “Of Mice and Men” Lon Chaney, Jr. would appear in no less than 41 movies. Once more in a Western setting he appeared as a saloon owner in “Frontier Marshall”, July 28, 1939 starring Randoph Scott as Wyatt Earp and Cesar Romero as Doc Holliday. This was the forgotten first version of Stuart N. Lake’s novel of that name which became John Ford’s 1946’s “My Darling Clementine” starring Henry Fonda. I recently saw the movie for my first time on the Encore Western Channel and it isn’t too bad a film. Lon had a substantial role. Although like in many versions of the OK Corral on film “Frontier Marshall” might stretch the truth a little about that famous gunfight more than even either Ford’s film, or John Sturges 1957 “Gunfight at the O.K. Corral” with Burt Lancaster and Kirk Douglas would do. Here is a link for those who might be interested on all the filmed versions of that famous Gunfight including the BBC's "Dr. Who". December 1939 had two interesting films released that month. On December 29th Charles Laughton appeared in RKO’s pictures “The Hunchback of Notre Dame” and the following day December 30th. Lon Chaney, Jr had third billing as Lennie. 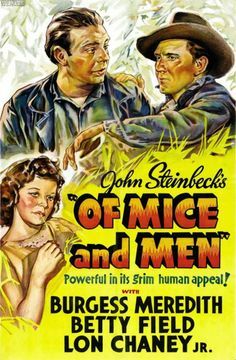 The picture was John Steinbeck’s “Of Mice and Men” and the film starred newcomer Burgess Meredith as George and Betty Field as Mae. Initially RKO had Lon audition for one of the roles his father had made famous Quasimodo. Should he had been cast in his father’s part there is no question Lon Chaney, Jr. could not have played Lennie in the United Artist film “Of Mice and Men” directed by Lewis Milestone the same year. 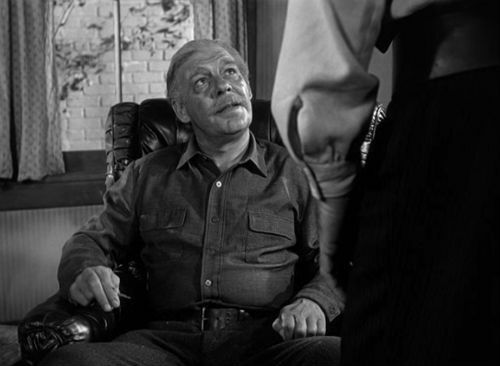 However Lon lost to Laughton and created a role he would always be associated with when movie versions of John Steinbeck are mentioned. Actually both Lon Chaney, Jr. and Charles Laughton were only considered for Quasimodo after Orson Wells who had just done his “War of the Worlds” broadcast turned the part down. Wells was afraid he would be type cast in Hollywood as either a Horror or Character actor like Karloff and Lugosi and that was not where he wanted to be in the film industry. Also that year Lon appeared in one of my favorite films Hal Roach’s original “One Million B.C.” playing Akhona the father of Tumak of the Rock Tribe. His son Tumak was played by new comer Victor Mature who was only seven years younger than Chaney. Other than grunts this was a silent movie and probably as close a performance to the style of the work of his father Creighton ever came too. 1940 was also the year Universal Studios decided to make more horror films, because of the success of releasing such 30’s classic as “Frankenstein”, “Dracula” and “The Mummy”. A search went out for actors and as his contract with RKO was expiring Lon Chaney, Jr. looked to his father’s old studio for a chance to follow in his footsteps. Some film critics believe that Lon went into acting to prove his father wrong about him becoming an actor and horror films in particular to equal him. His first film wasn’t exactly what he had in mind. 1941’s “Too Many Blondes” is described as a story about a man whose girlfriend turned him down to marry another. So he tries to break up his ex-girlfriend’s marriage. The three leads were singer Rudy Vallee, Helen Parrish and Lon Chaney, Jr.
Universal Studios needed a replacement for Boris Karloff. Who had flatly refused the role and the studio decided it was time for a Horror Movie with the son of their silent star. Actually the credits read: Lionel Atwill, Anne Nagel, Frank Albertson, Samuel S. Hinds and (In Large Letters at the bottom of the poster) “LON CHANEY, JR”. The movie was about a survivor of a bus crash a gentle soul name Dan McCormick who survived the accident because he appears to be immune to electricity. Mad Scientist Dr. Paul Rigas played by Lionel Atwill, naturally, sees him and wants to use Dan as a basis to form an army of “Electrobiologically-driven Zombies”. Say that ten times fast. Things go wrong and Dan eventually kills several people and Rigas before his electrically charged body runs out of energy and he dies. In 1956 Lon would appear in a very low budget film “Indestructible Man” with the tag line: “The Scream That Shocks The Screen With 300,000 Volts Of Horror”. The film is extremely similar to “Man-Made Monster” except that we are dealing with a convict instead of a bus accident survivor. The convict is sent to the gas chamber and then his body is unlawfully sold to a Mad Scientist played by Robert Shayne. Who wants to study the effects of electricity on human tissue and inadvertently brings the convict back to life. Two months after Lon Chaney, Jr made his first horror film in June 1941. Lon was in “San Antonio Rose’ not as a heavy or monster, but as the straight man for Shemp Howard as the pair became a faux Abbott and Costello. July would bring “Riders of Death Valley” a high budgeted 15 chapter serial in which Lon played a heavy the “Henchman Butch”. September found Lon in “Badlands of South Dakota” starring Robert Stack, Ann Ruthrerford and Richard Dix. Described as Indian raids are being perpetrated by an outlaw gang in disguise. Lon played the role of Jack McCall. In his autobiography Stack would state that Lon and his drinking buddy Broderick Crawford were referred to as “the monsters” at Universal Studio at that time "Badlands of Dakota" was made, because their drinking and rowdiness kept getting the two into trouble with the studio. “The Wolf Man” was the second werewolf film from Universal Studios. Henry Hull had played “The Werewolf of London” in 1935. Now it was Lon Chaney, Jr.'s time to create a role that would finally rival his father and become classic in the annuals of horror. The poster listed the actors as follows: Claude Rains, Warren William, Ralph Bellamy, Patrick Knowles, Bela Lugosi in large print. Next came Maria Ouspenskaya, Evelyn Ankers in smaller print and back to the large print at the bottom stating Lon Chaney as “The Wolf Man”. The character of Lawrence Talbot aka: "The Wolfman" is the only Universal Studio's monster to be played by the same actor in all of its appearances. Including "Dracula", "The Mummy" and "Frankenstein" from back in the 1930's through 1948 with "Abbott and Costello Meet Frankenstein". Universal at the time had no idea what they had just created and on January 23, 1942 Lon appeared in “North to the Klondike” with fourth billing after Broderick Crawford, Evelyn Ankers and Andy Devine. A routine movie about two friends in the Klondike who come to the aid of some settlers being terrorized by an outlaw gang. After another western “Overland Mail” released on March 13, 1942 Lon Chaney, Jr. was again teamed up with his "Wolfman" actors Ralph Bellamy, Lionel Atwill, Bela Lugosi and Evelyn Ankers. In addition with British actor “Sir” Cedric Hardwicke. Hardwicke had the picture's top billing as Henry Frankenstein's second son. Which meant Lon once more crossed paths with a Boris Karloff intended part that that actor had once more turned down. Lon Chaney, Jr was the monster of “The Ghost of Frankenstein”. The picture was the fourth movie in Universal Studio's Frankenstein series and the first without Karloff as the monster. Lugosi was once more Ygor. Lon’s features were clearly visible behind the face of the make-up originally created by Jack Pierce for Karloff in 1931. However, although Pierce as head of the department received screen credit it was actually his technician Ellis Burman who applied it to Chaney. Another important change to the character of the Frankenstein monster occurs in this picture. This change was created by Lon Chaney, Jr. to make the part his own and this would become a trademark for the monster from this film forward. The creature is blind as a result of being the sulfur pit ending from "The Son of Frankenstein": and the audience sees Lon start to walk with his hands out stretched as a blind man feeling his way. That gesture became a required movement of the Universal Frankenstein monster in all its appearances afterwards. One last point that confuses the viewer sometimes, That was who, or what was “The Ghost of Frankenstein” of the motion picture's title? In one scene Sir Cedric Hardwicke also appears as Henry Frankenstein to speak to his son, Colin Clive played the part in the first two films, his father’s “Ghost”. 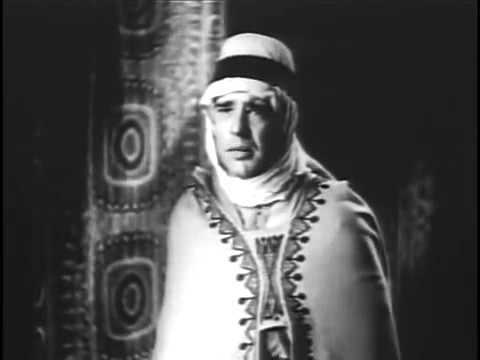 Below Harwicke as his father ghost. The motion picture was followed by an appearance with Robert Stack once more in a short subject and then playing a lovable crook named "Benny" in 1942's “Eyes of the Underworld" starring Richard Dix. Which brought Lon to appearing in another movie which strangely should not have established a horror character associated with his name, but did, and for the third time he was following in Karloff’s footsteps. Although admittedly in a roundabout way. In 1932 Karloff played Imhotep in “The Mummy” which in reality was a reworking of the script for Bela Lugosi’s “Dracula” the year before. The new owners of Universal Studio's were still looking at resurrecting in the 1940's their classic 1930's monsters and now turned to that “The Mummy” character. On September 20, 1940 the studio released “The Mummy’s Hand”. The film is in no way a sequel to the 1932 movie and has different characters, but some fans are convinced the two films separated by 8 years are directly related. The main reason the two motion pictures could not be related to each other is that the script for the first film was owned by the writer John L. Balerston. Baierston refused permission for Universal to reuse the character of Imhotep in what he saw would be a cheaply made quickie picture. He was right in one respect as in 1932 dollars the original Karloff vehicle had a budget of $196,000. While the 1940 "The Mummy's Hand" had a budget of only $80,000. In 1959 “The House of Hammer” also wanted to remake the original 1932 Karloff film with Christopher Lee in the role of Imhotep. The widow of John L. Balerston refused this time, because she considered Hammer films too bloody and full of half-naked women. Only after her death was Universal able to use the character of Imhotep once more in the 1999 movie “The Mummy” starring Brendan Fraser. Although the character of "Kharis" the Mummy of this new series would always be associated with Lon Chaney, Jr. The original role in "The Mummy's Hand" went to cowboy actor Tom Tyler. Tyler had played Luke Plummer the man “The Ringo Kid” played by John Wayne wanted to kill in John Ford’s classic 1939 Western “Stagecoach”. One year after "The Mummy's Hand" Tyler would star in the Republic Pictures serial “The Adventures of Captain Marvel”. Tom Tyler was cast as "Kharis" for one reason only. The film’s producers thought Tyler’s sharp features and dark eyes matched those of Boris Karloff close enough that footage from the 1931 film could be used in this one. Another indication that what script writer John L. Balerston thought of this film was probably true. Compare these two still of Boris Karloff and Tom Tyler. 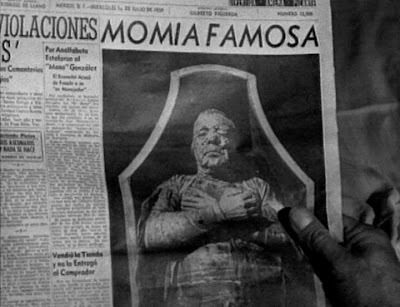 On October 23, 1942 “The Mummy’s Tomb” a direct sequel to 1940’s “The Mummy’s Hand” appeared. The story picks up the story of those who desecrated the tomb of the Princess Ananka 30 years earlier. Although Lon Chaney, Jr. hated the role of “Kharis” and those eight hour make up sessions associated with the character. As I previously mentioned Lon, not Boris or Tom, would forever be considered “THE MUMMY” of the Universal Studios Horror films. Two more appearances would follow in 1944 “The Mummy’s Ghost” and “The Mummy’s Curse”. Below Lon Chaney, Jr. as "Kharis". “The Mummy’s Tomb” had been directly followed by another Western and then “Frankenstein Meets the Wolf Man” released on March 5, 1943. The movie can be seen as either the first movie Universal Studios combined monsters, the fifth film in the “Frankenstein” series, or a direct sequel to “The Wolf Man.” I see it as the film that firmly established Lon Chaney, Jr. as a horror film actor. When the two grave robbers open Lawrence Talbot’s tomb writer Curt Siodmak made a slight dialogue change. Instead of “and the autumn moon is bright”. We now had “and the moon is FULL and bright”. This was the first time the werewolf legend was tied to a full moon. Lon was back playing Talbot the tragic soul cursed to never die and Bela Lugosi was now the Frankenstein monster. Bela was very upset that his character’s actions were now set as a result of Lon’s walking with his hands straight out in “The Ghost of Frankenstein” over the blindness. This is a major reason Lugosi’s monster seems so wooden. Bela was told NOT to improvise. The following is a true back story. At lunch with producer George Waggner screenwriter Curt Siodmak joked that he had a great title for a new movie. “Frankenstein Wolfs The Meatman”. Waggner not known for a sense of humor left after finishing his lunch and later called Siodmak to his office instructing him to change the title to “Frankenstein Meets the Wolf Man” and get the script to him as soon as possible. Lon next made a film I cannot locate, but must have been World War 2 propaganda as it was entitled: “What We Are Fighting For” and may also have been another war time short subject. However, this was followed by another Curt Siodmak script and one of my favorites of the 1940’s. Gloria Holden in 1936 had played Countess Marya Zaleska who is really “Dracula’s Daughter”. That film is unique as Universal Studio's got away with a lesbian vampire six years after the Hayes Office started dictating film morality. Now Lon Chaney, Jr. was recreating another of the studio's 1930's horror icons as the “Son of Dracula”. The film has an interesting script and Curt Siodmak’s trick of reversing Dracula’s name to "Alucard", "Dracula" spelled backwards, has reappeared in homage from time to time in other movies. However, when Count Alucard arrives at a New Orleans plantation and is revealed as being “Dracula” the audience sometimes becomes confused as to why he is Dracula’s son. They keep missing the part in the script where it is revealed that the original Count Dracula was destroyed in the 19th Century per Bram Stoker’s novel. However, the script contradicts itself when the character of the now vampire Katherine tells her boyfriend Frank that Alucard is really Dracula himself. Siodmak doesn’t make it clear if it is actually Katherine who is the one confused by being under Alucard’s control. I really enjoyed Lon is this part and the film is very moody. I think the scene at the end where Alucard discovers that Frank has set his coffin on fire and then realizes its daylight is classic. Lon Chaney, Jr’s facial expressions are just perfect as the Count goes from hated fury to the realization that his long life has finally ended. Some critics speak more of Chaney’s weight than his acting when writing, or speaking of this film. His performance is truly underrated. On August 27, 1943 a film Lon was born to be in was released without him. Universal Studios announced they were making a big budgeted and lavish Technicolor remakes of his father’s “The Phantom of the Opera”. As soon as Lon heard about this he and his agent asked outright for the part of the Phantom. From a strictly PR point of view the idea of a tag line such as: “Lon Chaney, Jr. Recreates His Father Lon Chaney’s Most Classic Role” would have been pure money in the bank. The Universal Studio’s executives flatly turned him down. They already had an actor in mind for the role Lon’s good drinking buddy Broderick Crawford. In the end the role of “Claudine, The Phantom” went to Claude Rains. Today the film is considered a musical horror story. Actually the main word here is musical. There are no real horror elements in the final cut.The Phantom has been regulated to a character that is needed, because the title requires it. Nelson Eddy’s career was waning and he needed a boost. The result was this film with its lavish opera productions. The give and take between the two suitors played by Eddy and Edgar Barrier over Susanna Foster is more reminiscent of Nelson Eddy’s operatic musicals from the 1930’s opposite Jeannette MacDonald than Gaston Leroux. A problem with his age and that of Barrier’s to Foster is always mentioned in the same vein as Gary Cooper to Grace Kelly in “High Noon”. Eddy was 41, Barrier 36 and Foster 18 at the time. Cooper was 51 and Kelly 23. One last comment is about the relationship between Christine and Claudine. Many people have the feeling there was a closer connection between the two characters than is shown in the film. They even speculate he was her father and they are correct. The one scene shot that makes that clear ended up on the cutting room floor where it sits today. The reason given for its removal was that it was felt that scene might make the relation between Claudine and Christine seem incestuous. Also to be noted was that the major cuts to the film were only in scenes with the Phantom. Claude Rains was excellent as the tormented Claudine and his Phantom is now mentioned frequently with the other Universal Horror/Thriller characters. However, one has to wonder what the film might have been like had Lon Chaney, Jr. played the role and anybody else, but Nelson Eddy's Anatole Garron? and then Lon's second appearance as “Kharis”. However if you have never seen “Cobra Woman”, released May 12, 1944, you are missing a movie that was played straight, but has become a camp classic that even Leonard Maltin gave it three out of four stars. Maria Montez stars as twin sisters on a tropical island. One good and one bad naturally. Lon, plays one of the main followers of the evil sister and the film co-stars John Hall and Sabu. Like Tony Curtis with his thick Brooklyn accent attempting to read the line “Yonder is the castle of my father” in Universal’s “The Black Shield of Falworth” which classically came out as “Yonda is the castle of my Fader”. Maria Montez said the classic line: “Geev me the Cobra jewl” after completing a Cobra dance were a snake which is more like a phallic symbol then a real cobra. Behind the scene shot of Lon and Sabu. Eight more films came which included three more of Universal Studios “Inner Sanctum” series where Lon had become the common thread and both the “Houses” of Frankenstein and “Dracula”. The eight pictures also included his final entry as “Kharis”. All of these motion pictures were followed by a break in style in a Western “The Daltons Ride Again.” Where along with Alan Curtis, Kent Taylor and Noah Beery, Jr. as the other brothers. Lon Chaney, Jr. played Grat Dalton in a Hollywood re-writing of their end. Then back to another “Inner Sanctum” quickie film and a turn at comedy in the 1947 Bob Hope and Dorothy Lamour film “My Favorite Brunette" with also co-starred Peter Lorre. Next another Randolph Scott western to start 1948 "Albuquerque"
All of these movies were next followed by a picture starring a duo Creighton Tull Chaney truly hated. 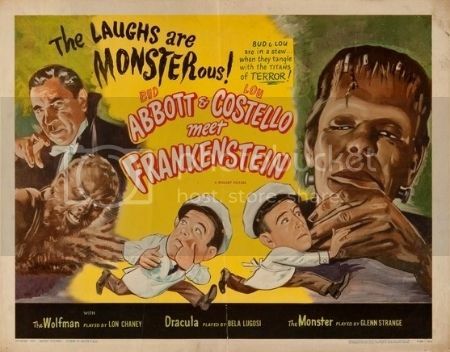 On June 15, 1948 he appeared as Lawrence Talbot aka: “The Wolf Man” with Bela Lugosi as “Dracula” and Glenn Strange once again as the “Frankenstein Monster” in a film most people call “Abbott and Costello Meet Frankenstein”. The original script name was “The Brain of Frankenstein”. The original poster title was “Bud Abbot and Lou Costello Meet Frankenstein”. The onscreen title is actually “Bud Abbott Lou Costello Meet Frankenstein”. Here are three publicity and behind the scenes stills for the film including one with Lon and Betty Page. We now come to the 1950’s and a combination of good, bad and ugly films for Lon Chaney, Jr. Along with appearances on television. Between 1949 and 1951 starting on NBC, switching to CBS and ending on ABC was a variety show “Versatile Varieties”. Going from one station to another was not uncommon in the early days of television. Sometime between August 29, 1949 and January 19, 1951 Lon Chaney, Jr. would be a guest star on the program. This was live television and the set up was a stage with tables on the sidelines where the non-performing guests would sit. On the stage different acts performed during the half hour between 9 and 9:30 PM when the program was on. The show was sponsored by Bonnie Maid Linoleum and the format had aspiring young actresses acting as both hostesses interviewing the guests and delivering the commercials for Bonnie Maid wearing plaid kilts. At the time Lon would have appeared these young ladies were Eva Marie Saint, Anne Francis and Janis Page. 1950 found Lon playing Red Lynch a heavy in the John Payne, Gail Russell film “Captain China” an adventure film about the redemption of a drunken China Seas captain that sounds like a rip off of another earlier Gail Russell film with John Wayne “Wake of the Red Witch” from four years earlier. Raymond Burr is the heavy in this film written and directed by Curt Siodmak. Lon is the Police Commissioner and hero of the picture. “Burly actor” was a nice way to describe the weight gain Lon was experiencing and would never loose. However, Lon was excellent in a small, but critical part in Stanley Kramers’ 1952 allegorical western “High Noon” under the direction of Fred Zinnemann. His role of former Sheriff Martin Howe is both touching and heart felt. Lon’s scene as the probably dying grey haired old mentor to Gary Cooper’s youthful Will Kane was unforgettable. As Howe tells him it isn’t worth confronting Frank Miller and dying in a job Kane no longer holds for people who never really appreciated him is powerful. It is more so when you consider that “Coop” was 50 years of age and Lon was just 4 years longer at 46. 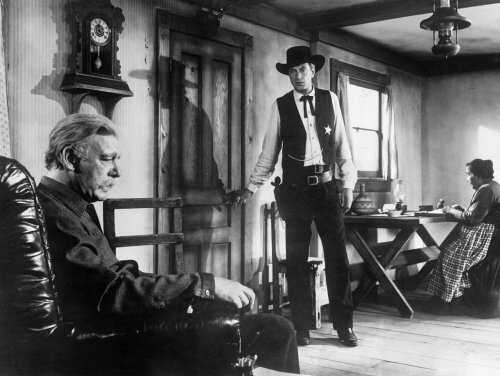 Gary Cooper and Lon would appear later in 1952 in “Springfield Rifle.” On December 15, 1952 an American made film by Universal Studios premiered in Sweden. It would be 10 more days before it was shown in the United States. The film was “The Black Castle” and it starred Richard Greene, Boris Karloff, Stephen McNally and Rita Corday billed here as Paula Corday. She also was billed in some films as Paula Croset. This over looked film is about a British gentlemen played by Greene who investigates the disappearance of two of his friends at an Austrian estate owned by McNally. The film is really very good, but as I said forgotten. Also in 1952 Lon Chaney, Jr. appeared on "Tales of Tomorrow" a "Live" television program in their production of "Frankenstein". Lon played the monster. Sadly, the actor was so drunk he thought the performance being aired was a mere rehearsal. In one instance in which he was supposed to smash a chair to pieces, he just lifts it, looks around in confusion, and places it back down carefully and unscathed thinking he’d have to destroy the prop at a later time. Three films later Lon played Spurge McManamee the father of Flamingo McManamee played by Ann Francis in the James Cagney film “A Lion in the Street”. Lon had seventh billing in what was a major motion picture in 1953 directed by “One-eyed” Raul Walsh and released by Warner Brothers. Seven films later saw Lon in 1955 playing Crime Boss “Big Mac” who springs Jack Palance as Roy Earle aka: “Mad Dog” Earle from prison in "I Died A Thousand Times". The film is a remake of the Humphrey Bogart/Ida Lupino 1941 film “High Sierra”. Unfortunately as it is a scene by scene remake the film seems outdated by 12 years. Shelley Winters played the Ida Lupino role of Marie. In the Bogart film there was a stereo typed comedy-relief character played by black actor Willie Best. As this was 12 years later that character had been replaced by a stereo typed Mexican played by Gonzales-Gonzales a really under appreciated character actor. “I Died a Thousand Times” was immediately followed by the Kirk Douglas film “The Indian Fighter” where again he played a Western heavy. Next Lon became part of an ensemble supporting cast in producer Stanley Kramer’s first turn as a director “Not As A Stranger” starring Olivia de Havilland and Robert Mitchum. Besides Lon those also he small parts included Frank Sinatra, Gloria Grahame, Broderick Crawford, Charles Bickford, Harry Morgan and Lee Marvin. Between 1954 and 1959 Lon Chaney, Jr. would appear in five episodes of “The Red Skelton Show” on CBS. In 1956 besides the already mentioned “Indestructible Man” was “The Black Sleep”. I mentioned this movie not for the quality, but the quantity. The leading actor was Basil Rathbone, but the supporting cast included Lon Chaney, Jr, Bela Lugosi, John Carradine and even Tor Johson. The part played by Akim Tamiroff was originally written for Peter Lorre. “The Black Sleep” was re-released in 1962 as “Dr. Cadman’s Secret”. Set in England in 1872 a surgeon is experimenting on people’s brain’s to learn how to reach a tumor in his beloved wife to save her. Basically "The Black Sleep" remains me of both “The House of Frankenstein” and The House of Dracula” in construction. Lon had third billing behind Rathbone and Tamiroff as Dr. Monroe one of the first victims of Rathbone’s experimentation. In February 1956 Lon had second billing behind John Bromfield in “Manfish” with Victor Jory. “Three deep sea divers get involved in murder while searching for treasure” is how the movie is basically described. I never saw this, but I am interested only because somehow “Manfish” set in Jamaica and also involving a Scotland Yard Inspector sent out to extradite a wanted criminal. Supposedly is based upon two Edgar Allan Poe stories “The Gold-bug” and “The Tell-Tale Heart” and I just want to find out how they pulled that off. I remember a television series in 1957 based upon James Fenimore Cooper’s “The Last of the Mohicans” which was very good. However, it only lasted one season of 39 episodes. In it Lon played Chingachgook who is the subject of Fenimore’s title. The series was then edited into three movies “Along the Mohawk Trail”, “The Redman and the Renegades” and “The Pathfinder and the Mohican” also in 1957. In 1958 Lon Chaney, Jr. appeared in an episode of the TV series “Tombstone Territory”. Followed in 1959 in an episode of “Rawhide” and one of “The Rough Riders”. From his first appearance on the television program “Versatitle Varieties” to his last television appearance on “The Monkees in A Ghost Town” in 1966 playing “Lenny”. Lon Chaney, Jr. made a total of 60 television appearances. Back on July 28, 1957 Lon was mining engineer Martin “Marty” Melville who with three others fly into unknown territory in Mexico and meet “The Cyclops” as envisioned by Bert I. Gordon. Of note is that Duncan Parkin who played Bruce Parton aka: “The Cyclops” also played the following year Glenn Manning aka: “The Colossal Beast” in “War of the Colossal Beast” originally played by Glenn Langan in the earlier “The Amazing Colossal Man”. To save money on “Colossal Beast” Gordon just recycled Parkin’s “Cyclops” make-up and actor. Gloria Talbott co-starred in both movies on the double bill mentioned below. You can read a short biography of her, Allison Hayes and Peggie Castle at the following link to my blog article on about the three 1950's Sci-Fi actresses. 1958 found Lon having a good role once more as “Big Sam” in Stanley Kramer’s “The Defiant Ones” starring Tony Curtis and Sidney Poitier. 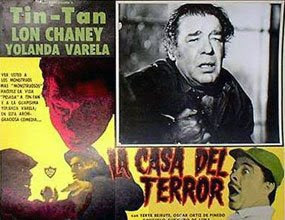 Lon's next appearance was in Mexico in the 1960 motion picture "Casa del Terror". Where producer Fernando de Fuentes hijo and his father the main writer Fernando de Fuentes. Came up with the brilliant, if low budget, idea of hiring Lon Chaney, Jr and combining him into a dual character of a Mummy that turns out to be a Werewolf. Believe it, or not this picture was actually a comedy starring Mexican comedian Tin Tin (German Valdes). Between 1960 through 1971 Lon Chaney, Jr. added 27 films for a total of 150 movies to his film career. One of the better quality films Lon appeared in was Roger Corman's 1963 "The Haunted Palace" starring of course Vincent Price with Debra Paget. The picture was based upon H.P. Lovecraft's "The Case of Charles Dexter Ward". Some of his other movies ranged from high quality Westerns such as Burt Kennedy’s 1967 “Welcome to Hard Times” starring Henry Fonda were Lon portrayed a saloon keeper. To cheap horror like the same years's “Dr. Terror’s Gallery of Horrors” aka: “Return from the Past” aka: “The Blood Suckers” aka: “Alien Massacre: aka: “The Witch’s Clock”. The movie contained a story entitled “Count Alucard” in which Jonathan Harker turns out to be a werewolf. Lon Chaney played Dr. Mendell and not Alucard. The picture's original title played off the Amicus British Production of two years earlier "Dr. Terror's House of Horrors" starring Peter Cushing and Christopher Lee. During this period we have to "face" the “Face of the Screaming Werewolf”. Film maker Jerry Warren pieced together scenes from two Mexican monster movies “La Casa del Terror (House of Terror)” which I mentioned above with Lon Chaney, Jr. and “La Momia Azteca (The Aztec Mummy)” released in Mexico back in November 13, 1957, but without Lon. The new “American” film contained newly short footage of Lon Chaney, Jr. and was released in 1964 with a running time of only 60 minutes. The two original Mexican productions had a total running time of two hours and twenty minutes. Another Jerry Warren film in 1965 called “The House of Black Death” featured Lon and John Carradine as two brothers, both are warlocks, battling each other with covens of witches over a family fortune. A group of country singers are headed for Nashville when their car breaks down and they have to spend a night in an old house.. What they discover is that a group of International Spied played by Lon, Basil Rathbone and John Carradine are also using the house as a hideout while they seek the formula for a special rocket fuel. Lon Chaney, Jr. gave a solid and very good performance in the basically unknown Western: “A Stranger in Town” released in 1969. The problem here is that one year earlier during the Spaghetti Western period another Western starring Tony Anthony "Un dollaro tra i denti, lit. (A dollar between the teeth) was released in the United States also titled "A Stranger in Town" and started a series of four excellent entries with Anthony. Lon played the lead “Doc Whitaker” in this small lost motion picture.